Here's a superb new online slots game from Novomatic which you can have fun playing. Get ready to feel your heart going fast, your stomach is experiencing a rollercoaster of emotions and your overthinking what to say. Remind you of anything? It’s that feeling of being hit with Cupid’s hypnotising arrow, tunnelling your vision into a sea – at least for that special someone. Well, at least that’s the theme of this online slot game anyway. Every element will take you away to a cheesy and heart-warming land of love: the kind of place where everything Is covered in the reddest roses and everybody is screaming “I love you so much” at each other. Despite pulling on your heartstring, this online slot game is also great fun because as well as its welcomed tacky decorum, there are some adorable winnings to be had on the 5 reel slots with 25 pay lines. Check out our entire list of play video slots. Novomatic have been excelling at online slot games since 1980. They are an Austrian based company with somewhat of a global reputation, trading in over 70 countries. The reputable brand can be trusted to turn out unique themes of well-designed online slot games – more times than not, they come with some brilliant bonus features and special editions. If you love promo's, get the best slot bonuses in the UK today. The Valentine’s day is prominent in the background of this game. There is an eruption of bold reds and pinks – to comfort the heart and fortify the emotions of love. This is not forgotten about in the symbols which involve romantic, scented candles; red roses, expensive chocolates (the kind that come in a box that is) and champagne. There is also a bottle luxurious perfume (that obviously implies that this will do the trick for all women, well you can never say all but a large percentage). The love can really be felt with the 800,000 credit jackpot! But like the game of love, you have to work hard and the gamble in ‘Cupid’s arrow’ comes at a 50/50 gamble. There are three bachelors that appear in the game’s backdrop, depending on the round. Each handsome guy represents a different country and in this case: London, San Francisco and of course the all romantic Paris. Girls Night Out – 10 free spins, with additional symbols. These include a wallet and a female character. Shopping Spree Bonus – Pick from over 24 items from various shopping locations. 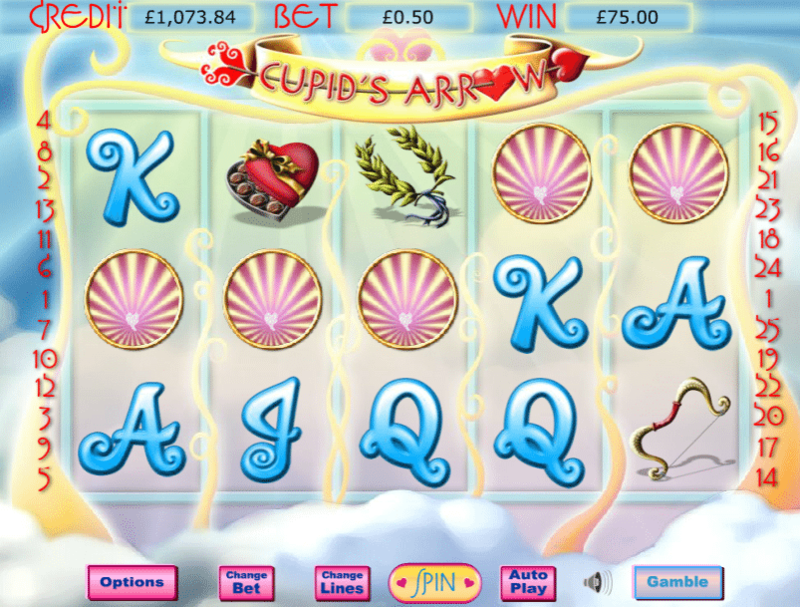 Cupid’s Arrow Free Spoons – 15 free spins. Cleopatra will also appear on the first, third and fifth reels. She is a wild symbol that powers replace all other symbols. WILDS come in the form of cupid’s arrow itself (replaces all symbols except the bonus scatter and any wilds). 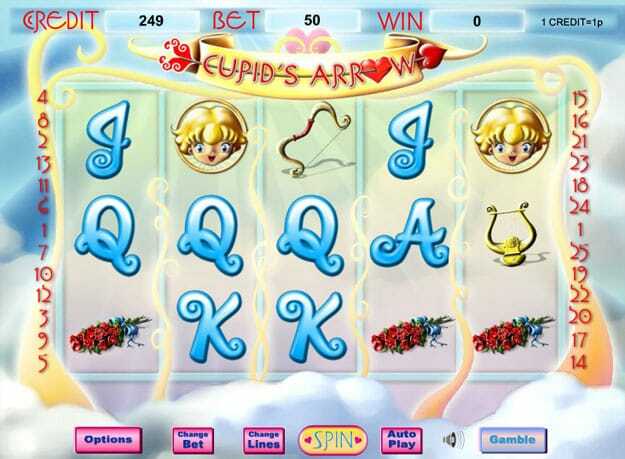 Other wilds are displayed as Cupid (only on reel 5), he will increase the number of wilds which will increase the opportunity to win.